Photos courtesy of Lindsey Hillesheim of The Uff Da! Chronicles. What is your pre-race routine? How much do you ride the course? At what pace? Do you also walk the course? Warm-up with a trainer, on the road, on the grass? Wes Schempf (C3-Athletes Serving Athletes, 2nd Place Men’s Elite):Get to the race venue early (12-12:30) and get bikes ready. If the course is dry I’ll do a couple laps on it. One at an easy pace and maybe two at a faster pace just under race pace following someone or riding the lines I scouted out earlier. I’ll warm up on the road if it is nice, but if not then I’ll sit on the trainer. Jennifer Maxwell (ATAC Sportswear p/b The Bike Rack, 2nd Place Women’s Elite): (1) Arrive to the event at least 2 hours before my race so this allows at least a few laps on the course before my actual warm up. (2) register, put my back up bike in the pit after checking air pressure, change into my new ATAC Sportswear p/b the Bike Rack skinsuit and warm up on the trainer for at least 45 min to an hour at a moderate to intense pace. Lenore Pipes (Unattached, 3rd Place Women’s Elite): always try to get on the course before the race because the first lap is usually chaotic and it helps to know what is coming up next. I try the trickier parts at race pace. If someone let’s me borrow their trainer, I’ll sometimes use it. Adam Driscoll (Adventures for the Cure, 3rd Place Elite Men): My pre race routine was to watch the B race as we had Patrick Blair racing in there with a 3rd place finish. After that I rode the course very easy with Jimmy Klose (CAT 4 winner) to see it for the first time. Later I did the course at least 3 more times. Lee-Ann Beatty (Penn State Hershey Cancer Institute-Cannondale, 1st Place Women’s Cat 4): Oatmeal in the AM, pre-ride the course, banana before the start. I ride the course once or twice, depending on the length of the course. Ride at moderate to tempo with a few hard effort sprints. Tom Mackay (C3-Athletes Serving Athletes, 2nd Place Men’s 3/4): I typically ride the course 1 or 2 times as slow as possible. I look for pot holes, ruts and slippery sections. After that I warm up on rollers, everyone’s probably heard ’em. Jay Morali (C3-Athletes Serving Athletes, 3rd Place Men’s Masters 3/4): I get to the race early and usually only ride the course once and probably don’t ride it as fast as I should but I’m not really warm at that point. I have been bringing my road bike to warm-up on the road for a bit and then a final warm-up on the cx bike with a few efforts and dismounts at a quicker speed to get use to the turns. I usually just warm up on the road/grass around the area the race is. Patrick Blair (Adventures for the Cure, 3rd Place Men’s 3/4): I like to arrive early, around 7:30am, so that I can get at least 1 or 2 warm up laps in before the first race of the day. I watch the CAT4 race, and then at 10am I ride on the road for a bit to get my heart rate up. Do you listen to music pre-race? If so, what is your go-to tune(s)? Becky Frederick (Kelly Benefits Strategies/LSV, 2nd Place Women Cat 4): Saturday I drove by myself to the race, and for some reason decided to listen to some Harry Potter on CD. Dunno if it made me faster, but it did make the drive less tedious. Wes Schempf: I used to, but haven’t lately. I’ll probably get back into it. I have a playlist that I listen to on my iPod. Jennifer Maxwell: Never, I just enjoy warming up on my own or with friends but I always watch the Master’s race to see how they are taking the technical sections. Lee-Ann Beatty: Yes, Techno and Rap. Adam Driscoll: No music pre race. I did a little bit of warming up with Ian from BBC beforehand though. We chatted about Granogue which is coming up in a few weeks. Patrick Blair: I don’t usually listen to music but when I do I like anything that is hard rock (angry music). Tom Mackay: Nope, in the car on the way up I will get psyched though, currently it’s the theme to “Road to Roubaix” my parents think its funeral music but it works for me. What was your favorite part of the BCA course? What feature could you have done without? Tom Mackay: The long strait “jack hammer sections” I could have done without, and as always, I LOVE the turns, on and off camber. Lenore Pipes: I liked the power climb. I would’ve rather had the sand pit before the barriers so I could ride through it. Wes Schempf: The off-camber turn on the steep hill before the pit and the barriers before the sand pit. I could do without the narrow start chute and the tree in the course just before the finish. Jay Morali: The course was a little bumpy at times but there was some fast sections that were really fun. Jennifer Maxwell: I liked the sand section. I could get on and off the sand quickly Least like … the bumps. Lee-Ann Beatty: The tight turns around the official/announcers area, before the hill. Could do without the hill! 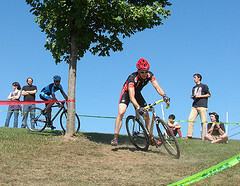 Adam Driscoll: Favorite part of the course was the off camber power parts of the course. I could really get my speed up and catch up during this time. There were a lot of these which made it a nice course for me. Becky Frederick: Favorite—all of the off camber turns and the whoop-de-doo just before the finish. Least favorite—the untaped start section where it was possible to head over to the pavement under the overhang instead of toughing it out around that corner on the gravel. Patrick Blair: The long straight sections (off camber) are great for me since my technique is my weakness. Patrick Blair: I fell down a few times in the 1st lap and then a guy behind me told me “dude! you just have to chill out, you are killing yourself and me, don’t worry you will work your way to the front.” I told him that he was right and after that I tried to calm down and focus. I did not fall down after that and I moved steadily up through the field. Tom Mackay: The start, very fast downhill gravel road. The first row hole shot was very important and I took it but in the subsequent straight-aways I lost ground. The parts that made my race were the mistakes I didn’t make, I didn’t roll a tire. I didn’t let my bike get lose on the turns. A few of the top five guys had problems, the ones who survived had a good result. Lenore Pipes: I think I played it smart and stayed at the front of the race until the last lap where my tire was going flat. Wes Schempf: Jeremiah attacked along the top of the off camber section about halfway through the race and I just couldn’t get back on his wheel. Kenneth Morris (Winchester Wheelemen) and Jay Morali battle the climb. Jay Morali: I was very careful at the beginning of the race not wanting to make any major mistakes because this was the first time I had raced this course. That is a bad idea when you are racing with really fast guys like Chip Hoover and Keith Rohr. They both quickly put in gaps that I could not close. Fortunately I was able to hold off hard charges by Neal Sapp and Kenneth Morris to secure 3rd. Jennifer Maxwell: On the last lap Lenore and I were going up the hill behind Betsy and Lenore stumbled and I was behind her, Betsy got away and Lenore and I had to chase. When we got to the sand section and Betsy was not reachable I decided to punch run into the sand and remount as efficient as I could and that was when I was able to drop Lenore. Lee-Ann Beatty: I was lucky enough to have the lead from the very start because of my sprint. When I realized this I decided to go hard for the entire first lap then try and pull back a bit to recover as long as I was still sitting comfortable in front. During my second lap I simmered down a bit to prevent myself from blowing up. However, Cyclocross is a tricky sport that plays mind games with you because you can never REALLY tell how far or close your competition is. It appeared that maybe someone was closing in on me so I picked it back up going into the 3rd lap and just maintained that pace until the end…Whew! Adam Driscoll: First moment was when I was sitting in 5th behind a Alan guy and he went down right in front of me on a sharp right hand turn. I almost ran him over but instead I just hit his front wheel and I was able to get by. It was a close call for me almost going down. After that I was in 4th and 5th was starting to catch me and at one point my lead got only to 5 seconds and thought he might catch me with about 3 laps to go. I made a strong push and got the lead back up to 20 seconds. From that point on I was by myself just trying to catch 3rd place as I was now in 4th position. I came across thought I was 4th and then announced I was 3rd big surprise. Overall great race for me. Did you change anything from last week in your preparation for the race or during the race itself? Adam Driscoll: No big change from last week’s race. One thing that is helping me is I am learning who all the riders are in the A race. This has helped because I know when to move at certain times. I saw Joe [Dombroski] (Haymarket) move early and I went with him on the 2nd lap to move up nicely. I am also learning exactly how much insulin I need for the 60 minute race since it is a little longer than the 45 minute race. I seem to have my sugars down very well during the race. Tom Mackay: Ate a good breakfast, last week I had peanuts. Lenore Pipes: I did five more running sprints. I think it helped me get through the sand faster. Wes Schempf: Not that I remember. Jennifer Maxwell: I had my husband glue my Dugast rear tubulars back onto my Easton Wheels. At the UCI race In VT (Schoolhouse Cyclocross in Williston, VT) last weekend I rolled a tire due to too little glue on the rim. I had a terrible race and decided to stay local this week hoping for better luck. Now my husband will always glue my tubulars for me. Lee-Ann Beatty: Yes, I chose lighter wheels. Becky Frederick: I ate a donut. A yummy chocolate one. I wish I had another one right now. Patrick Blair: I try to keep things consistent. Wes Schempf: Thanks to my wife who is a superfan and all my sponsors C3, Athletes Serving Athletes, Blue Competition Cycles, Hostetter Insurance, Bontrager, SRAM, Giro, Tifosi. Tom Mackay: C3-Athletes Serving Athletes, my new team, Great People. Lenore Pipes: Thanks to all the volunteers, sponsors, and promoters that make cx racing possible. I really dig it. Thanks also to Echappe Equipment for helping me out with such a fast wheelset. They were definitely an advantage on this course. Jay Morali: Big thanks to Kris Auer and the crew at Joe’s Bike Shop for getting my broken rear wheel up and running on short notice! Adam Driscoll: Shout out to our team! This weekend we had lots of podium finishes and I am thinking now Adventures For the Cure might be 2nd overall team in the overall team standings! Jennifer Maxwell: Thank you ATAC Sportswear (BC CANADA) and The Bike RACK DC for their generous sponsorship this season. 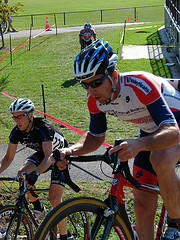 Patrick Blair: I have to give a shout out to my teammate Adam Driscoll who went 3rd place in the CAT 1/2/3 race!! Lee-Ann Beatty: To all the brave women who have battled with breast cancer! As well as, Pro Bikes, Deb Lewis from Cannondale and my coach Suzanne Atkinson, Steel City Endurance. Thank you ALL! Becky Frederick: The award for most rear wheel changes and furthest distance run in a weekend goes to Matt B. He rolled tubies both days and had clincher trouble Sunday for a total of three pit visits. Sunday he ran about 1/2 a lap of the Kelley Acres course back to the pits with a tubie dangling only by the stem. Great article; love the format.